Crown Publishing Group (NY), 9780307719874, 296pp. "A smartly written romance, mystery and historical adventure all wrapped up in a page-turner that will have you guessing until the very end." Adena Halpern, author of "The Ten Best Days of My Life"
Three years after her husband Max's death, Shelley feels no more adjusted to being a widow than she did that first terrible day. That is, until the doorbell rings. Standing on her front step is a young man who looks so much like Max same smile, same eyes, same age, same adorable bump in his nose he could be Max's long-lost relation. He introduces himself as Paolo, an Italian editor of American coffee table books, and shows Shelley some childhood photos. Paolo tells her that the man in the photos, the bearded man who Paolo says is his grandfather though he never seems to age, is Max. "Her" Max. And he is alive and well. As outrageous as Paolo's claims seem how could her husband be alive? And if he is, why hasn't he looked her up? Shelley desperately wants to know the truth. She and Paolo jet across the globe to track Max down if it is "really" Max and along the way, Shelley recounts the European package tour where they had met. As she relives Max's stories of bloody Parisian barricades, medieval Austrian kitchens, and buried Roman boathouses, Shelley begins to piece together the story of who her husband was and what these new revelations mean for her "happily ever after." And as she and Paolo get closer to the truth, Shelley discovers that not all stories end where they are supposed to. SAMANTHA SOTTO fell in love with Europe s cobbled streets and damp castles when she moved to the Netherlands as a teenager. Since then, she has spent nights huddled next to her backpack on a Greek beach, honeymooned in Paris, and attended business meetings in Dusseldorf in the pleasant company of a corporate credit card. 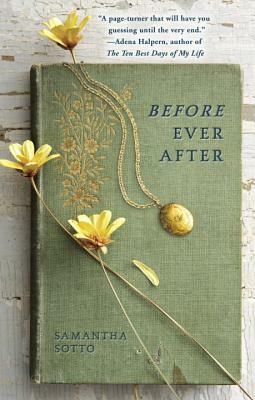 "Before Ever After" was inspired by her experiences living, studying, and traveling through Europe. This is her first novel."